Type using English keyboard in the box given below. As soon as you'll press SPACE, the word will convert in Marathi. For example, to write "भारत" you should type "bhaarat" and then press SPACE key. If you want to type something in English in the middle of Marathi text, press Ctrl+g to toggle between English and Marathi. TechWelkin English to Marathi Translation and Marathi Typing with English Keyboard is a utility that gives you a clean interface to easily type in Marathi on your computer. This tool on-the-go converts the Roman text into Marathi Unicode text. For example, if you need to type "मराठी", just type "maraathi" in the above box. As soon as you will hit SPACE key, the English text will convert into Marathi Devanagari text. Unicode is a standard that defines all the letters in all the languages around the world. The beauty of Unicode is that if you will type text in Unicode, then your text could be easily read on all the computers without installing any software. Consequently, it is always recommended that you type Marathi in Unicode. The above given typing tool allows you to type in Unicode text. So, you copy the Marathi text from above box and paste it anywhere in the computer; for example Gmail, Facebook, Twitter, MS-Word document etc. Marathi is an Indian language which is primarily spoken in the state of Maharashtra. Marathi is written in Devanagari script. That’s why Marathi text looks similar to Hindi text. A typist who is well-practiced in typing either of these languages, can type easily in the other as well. Marathi people love their language and it is no surprise that millions of native speakers want to type Marathi on computer and Internet. Earlier when Unicode standard was not there, typing Marathi on computer used to be done with old fonts like Kiran, Saras and Lekhani etc. These fonts had limitation that Marathi text typed in these fonts was legible only on computers that had these fonts installed. All this changed when Unicode was announced for Marathi. It has now become very easy to type online in Marathi as well as convert the old Marathi fonts into Unicode fonts (like Akshar). To be able to type in Marathi on computer you don’t need to be a professional typist. TechWelkin tool for online Marathi typing translates English characters into Marathi characters on its own. That means that you will use the regular English keyboard and type using Roman letters. The above tool will automatically do English to Marathi translation. This translation is actually conversion of letters from Roman to Marathi script. This process is called transliteration. You can save the typed Marathi text as an MS-Word document. This feature may not work in Internet Explorer. If you’re using Internet Explorer, you can manually copy the typed text and paste it in a Microsoft Word document to save it. Best would be to start using better browsers like Google Chrome or Firefox. 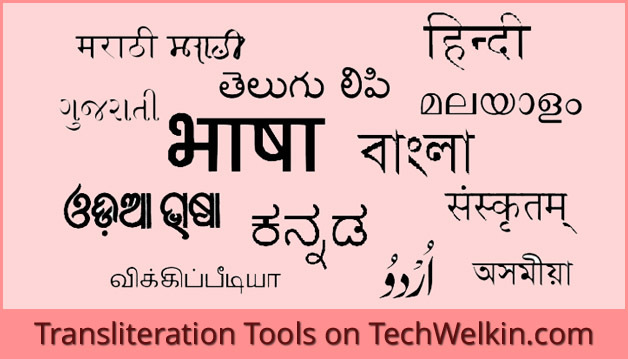 We hope that TechWelkin tool for English to Marathi translation will be of use for you. Do let us know your feedback on this.